In a verdict likely to anger the families of victims, judges in Germany ordered the release of a key accomplice to a neo-Nazi gang that murdered 10 people over a seven-year campaign of racially-motivated violence, saying that he had served enough of his sentence to no longer pose a flight risk pending his appeal. Wohlleben, born in the east German city of Jena in 1975, had a long history of far-right political activity before he fell in with the cell, for whom prosecutors said he was a kind of "guiding spirit" and "mastermind." 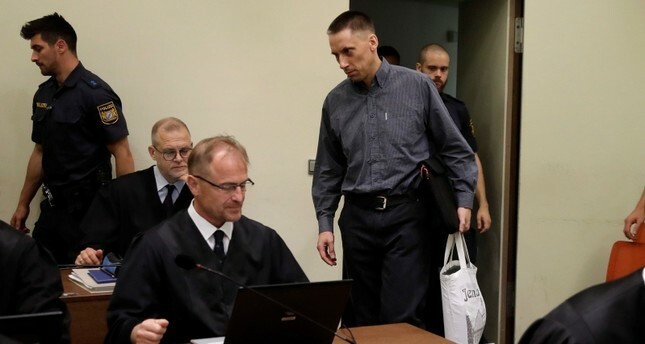 "After the court gave Ralf W. A 10 year sentence last week, he has at most three years and four months still to serve should his conviction be confirmed," Florian Gliwitzky, spokesman for the Munich higher regional court, said in a statement on Wednesday. The arrest warrant was lifted on Tuesday, the court said. Wohlleben walked out of the Stadelheim prison in Munich on Wednesday morning, a spokeswoman for the prison said. The court does not know where Wohlleben is staying after his release. In freeing Wohlleben, the Munich court was acting on the advice of the federal prosecutor who felt that detention is no longer necessary. He is the second person to be released in the case. Andre Eminger, who arranged rental and mobile homes for the NSU was ordered to be released by the court announcing a final verdict in the lengthy case last week. Eminger has already served his time – two and a half years – in pre-trial detention. Carsten S. who is accused of physically handing the gun Wohlleben supplied to the NSU and Holger G., another accomplice of the gang, was sentenced to three years in last week's final hearing. Wohlleben's release faced criticism while authorities assured the public that he would be kept under surveillance. "There could hardly be a harsher blow against the relatives and victims," said Niema Movassat, a lawmaker for the Left Party, on Twitter. The top security official in Wohlleben's home state of Thuringia warned that Wohlleben, who was steadfast in refusing to help investigators, would be kept under strict surveillance. "He is a hero in that [far-right] scene – he always kept silent," Stephan Kramer, head of Thuringia's domestic intelligence service, told RND media group. "We will keep a close eye on him." The trial started five years ago, but it failed to respond to allegations of a cover-up of intelligence services' ties to the gang and the neo-Nazi scene in general. Critics of the case claim police and intelligence services hired people from the neo-Nazi scene as informants trying to erase their tracks leading to the NSU case. Despite its links to many gangs in Germany's neo-Nazi scene, the NSU apparently went unnoticed for years, from the late 1990s to 2011. Authorities initially blamed domestic disputes in the Turkish community for the murders and other crimes between 2000 and 2007. The unsatisfying conclusion of the trial has drawn reactions from Turkey, families of victims and a number of German lawmakers. Gamze Kubaşık, daughter of Mehmet Kubaşık, one of the Turkish victims of the gang, has said that the verdict was an important step for the families of victims, adding that more needs to be done. "I hope other accomplices of the NSU will be found and tried," she said after last week's hearing. Foreign Minister Mevlüt Çavuşoğlu told reporters after the verdict last week that although it was important that Zschaepe and the gang's accomplices were sentenced, the process failed to reveal the "others behind the murders." "Defendants openly admitted that they had the support of [German] intelligence and deep state, but who or which agencies were behind them was not investigated. It is safe to say that the court failed to shed light on the real culprits," he said. "Who are the people behind these murders? Which agencies are involved? Those people should be sentenced as well," Çavuşoğlu demanded.